University of California Press, 9780520274044, 176pp. Like the bestselling Infinite City: A San Francisco Atlas, this book is a brilliant reinvention of the traditional atlas, one that provides a vivid, complex look at the multi-faceted nature of New Orleans, a city replete with contradictions. More than twenty essays assemble a chorus of vibrant voices, including geographers, scholars of sugar and bananas, the city's remarkable musicians, prison activists, environmentalists, Arab and Native voices, and local experts, as well as the coauthors’ compelling contributions. Featuring 22 full-color two-page-spread maps, Unfathomable City plumbs the depths of this major tourist destination, pivotal scene of American history and culture and, most recently, site of monumental disasters such as Hurricane Katrina and the BP oil spill. The innovative maps’ precision and specificity shift our notions of the Mississippi, the Caribbean, Mardi Gras, jazz, soils and trees, generational roots, and many other subjects, and expand our ideas of how any city is imagined and experienced. Together with the inspired texts, they show New Orleans as both an imperiled city—by erosion, crime, corruption, and sea level rise—and an ageless city that lives in music as a form of cultural resistance. Compact, lively, and completely original, Unfathomable City takes readers on a tour that will forever change the way they think about place. Rebecca Solnit is the author of many books, including Savage Dreams, Storming the Gates of Paradise, and Infinite City: A San Francisco Atlas, all from UC Press. Rebecca Snedeker is an Emmy Award–winning independent filmmaker and native New Orleanian. "Rebecca Snedeker and Rebecca Solnit's Unfathomable City: A New Orleans Atlas is a book about New Orleans, but it's also a book about the kind of shared experiences and tensions that could exist in almost any city. Twenty-two maps illustrate ancient and recent histories of the Crescent City, with local tabs that inspire hums of pride. . . . Though many of those labels are specific to New Orleans, the themes they highlight exist other places, making the book not only a local's guide to the city, but also an anthropologist's guide to the idea of metropolis." "...an essential introduction to NOLA." "Unique maps and eclectic essays pair to create a thought-provoking portrait of a singular city." "An elegant and fascinating volume of maps, essays and artwork. . . . The result is intelligent, often beautiful prose and compelling maps in an exciting exploration of the idiosyncratic details, gestures and rituals that determine how people inhabit, love and perceive this elusive and entrancing city." "'Unfathomable City's' secret weapon is its imaginative cartography. . . . Each chart, like a plate in a restaurant, has ingredients and flavors that take the reader deep into the city's history. If you think you know these streets, this atlas will make you want to walk them again." "A deeply illuminating assemblage of maps and essays." "New Orleans natives tell the same story in boardrooms and bus stops: Their city is a puzzle wrapped in a tease, a mystery scented by sweet olive and garbage, veiled by humidity, echoing with brass bands and the occasional gunshot. That’s the mystery probed on each page of 'Unfathomable City: A New Orleans Atlas,' the grand, map-laden anthology assembled by local filmmaker Rebecca Snedeker and the celebrated essayist and thinker Rebecca Solnit." "The maps are playful, colorful and alive—in contrast to the utility we're used to with online mapping sites and apps. They're a joy to study; New Orleanians will no doubt pore over the map depicting the ongoing revival of once moribund St. Claude Avenue and the parade routes of the city's archaic but surviving social-aid and pleasure clubs. Tourists familiarizing themselves with the city may spend more time on the "Repercussions" map, tracing jazz history and club locations, or Billy Sothern's "sites of contemplation and delight," featuring sculpture gardens, synagogues and Meyer the Hatter. . . . Ms. Solnit and Ms. Snedeker prove that atlases can still fire the imagination and incite wonder." "A brilliant reinvention of the traditional atlas. . . . Compact, lively, and completely original, Unfathomable City takes readers on a tour that will forever change the way they think about place." "With “Unfathomable City,” Solnit and Snedeker have produced an idiosyncratic, luminous tribute to the greatest human creation defined by its audience participants: the city itself." "The New Orleans the book charts is unfathomable 'because no two people live in quite the same city.' The twenty-two vignettes in this collection speak to that individual appreciation in twenty-three distinct voices, yet whatever the topic—apothecaries, lead poisoning, lemon ice, institutional abominations, sugar, bounce music, environmental calamities, shifts in the road, bananas—they burn bright, both breaking and gladdening your heart; and the handsome cartography is illuminating in the best tradition of maps: taking you there, for better or worse. . . . New Orleans may be porous as a sponge—in many ways, from its acceptance of refugees to water-charged soil types—but the writing here has a high specific gravity, a chewiness that makes you want to pay close attention and count your bites." "A fascinating look at New Orleans. Through 22 maps varying in their strange detail and beauty, each accompanied by an essay, Solnit and Snedeker put together a deep portrait of the city and so much of what makes it unique." "Importantly, the book never fetishizes New Orleans. By addressing both the vibrant culture of public celebration (the second lines and the krewe parades and the near-constant festivals) and New Orleans’s bleaker side (environmental exploitation, the opportunism of the banana industry, the failures of post-Katrina authority), Solnit and Snedeker present an honest portrait. They delve deep into the city’s history, as far back as pre-European colonization, and resurface in the present, with bounce music and housing projects. Moreover, unlike many recent New Orleans books, they don’t overly dwell on Katrina to milk sympathy or a morbid interest from their readers. In short, Unfathomable City is beautifully balanced." "A treasure trove of rich reminiscences that will be appreciated by the native, and appeal to past and future tourists." "The effect of Unfathomable City and the series of which it is a part is that of a healthy and bracing critique—one that we urgently need in this time of ubiquitous geographic information. It is a critique we should hope will extend to other American places as this lovely series continues." "A beautifully creative and colorful atlas of New Orleans . . . a rich visual and literary banquet, serving up a kaleidoscopic array of perspectives on the city's multifarious peoples and their struggles and victories." "New Orleans is suffused with history, with mystery, with violence, and with sublime beauty. From shrimp po-boys to extravagant Mardi Gras floats, from the enormous live oaks lining St. Charles Avenue like silent, ancient sentries to second-line parades with loud brass bands weaving their way over pothole-laden streets, New Orleans leaves an impression. Trying to understand and make sense of all the facets of the place, and all the attendant contradictions, is a task with seemingly no end. 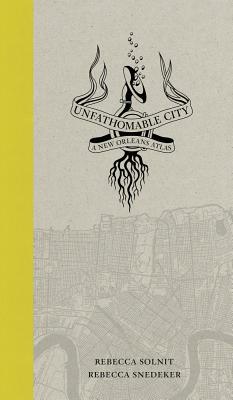 The beautiful Unfathomable City: A New Orleans Atlas can help with this, and I’d highly recommend it to anyone the least bit infatuated with the Crescent City. Part coffee table book, part history and culture guide, Unfathomable City is, like New Orleans herself, unique. Filled with twenty-two gorgeously illustrated and colored maps of the city, each spread across two pages, it’s an atlas that aims to both educate and challenge." "Beautiful cartography and from-the-street, intimate essays by lives lived in this city. My wanderlust was sated." "[New Orleans] history in tantalizing narrative nuggets; This book is part visionary road map, part post-­traumatic Katrina therapy and part poetic love ode/lament to our city; After reading this book you’ll want to go out and map things that are important or quirky to you." "I love reading anything Solnit writes, for she is a thinker, and I appreciate her take on things." "The book is a must . . . Unfathomable City is a real treasure."